Twenty base cards cover season six. Each episode has two cards. Rittenhouse has used a couple of different autograph designs for their previous True Blood sets. The autographs here all have the bordered look. Leading the list of signers is Ryan Kwanten, who plays Jason Stackhouse. 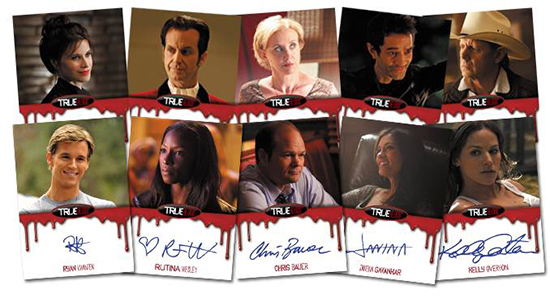 The 2014 Rittenhouse True Blood Collector's Set also has a couple of incentive cards. For those buying three sets, there's a full-bleed autograph of Stephen Moyer. He plays Bill Compton. The six-set incentive is an Alexander Skarsgard (Eric Northman) Silver Signature Series autograph. 20 cards. Two for each season six episode. 10 cards. Full set included with each factory set.